Home Entertainment Celebrities Ranveer Singh’s Message for Mohsin Naveed Ranjha Will Make You Proud! Despite the ban on Pakistani artists in Bollywood and the growing tension between India and Pakistan, celebrities from both sides of the borders always try to collaborate and come up with outstanding results. 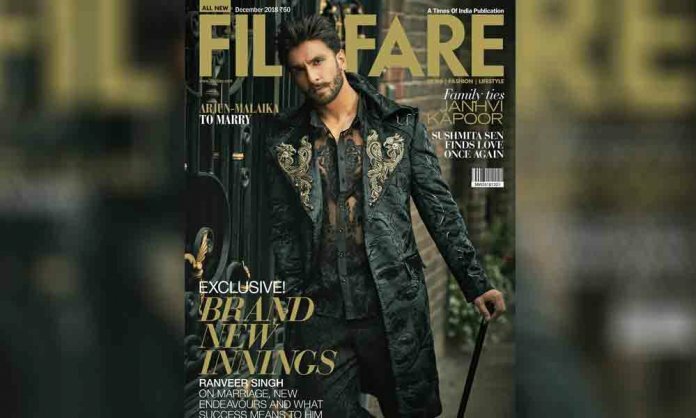 A few months ago, it was revealed that the Bollywood heartthrob Ranveer Singh will be collaborating with talented Pakistani designer Mohsin Naveed Ranjha for the latest edition of Filmfare magazine and it created a lot of buzz on social media. However, the cover of the magazine has finally unveiled and the handsome hunk Ranveer looks absolutely regal in it. The young superstar can be seen in a black sheer shirt with embroidery and he teamed it with an oversized black coat. We’d be lying if we say it doesn’t complement the current shaadi vibe and his personal style as well. Ranveer’s charm quotient can be seen at its peak in the picture which was taken by London based photographer, Anisha Vasani. So much so, Ranveer Singh too is all praises about our Pakistani designer and his message for Mohsin is full of admiration. Mohsin made some amazing clothes. It is the first time I am wearing Mohsin and he has smashed the looks. I love the detailing. I love the cuts. He is extremely talented and made me look really good. Watch Singh’s complete message for Mohsin Naveed Ranjha here! The magazine is all set to be released in the coming month and we just cannot wait to see more pictures of the actor. The ace designer Mohsin has already collaborated with a number of Pakistani divas including Maya Ali and Mehwish Hayat and he has also designed outfits for the super hit film Teefa in Trouble and blockbuster drama Suno Chanda. Did you like Ranveer Singh’s look? Let us know in the comments section below. The post was originally published on Very Filmi. Previous articleICC World Cup Trophy: Ever Wondered Where it is Kept After a Team Wins it? Next articleYouTube’s Latest Campaign for Students an Attempt to Boost Subscribers?